Super Slim, Built to Last! We all spend a good portion of our budget on clothing. It amazes Oma how anyone can expend such time and effort on locating the perfect shirt and/or dress; rush home only to hang the new treasure on an inferior wire hanger. The BriaUSA Dry Wet Amphibious Hanger come with ten hangers that are perfect for keeping your clothes wrinkle free and off of the closet floor. Their unique design, with rubbery bumpers at the top and at the base, really works well to keep items from slipping. I love that you can buy the hangers different colors in order to better organize your closet. It is also very convenient how the hook swivels. 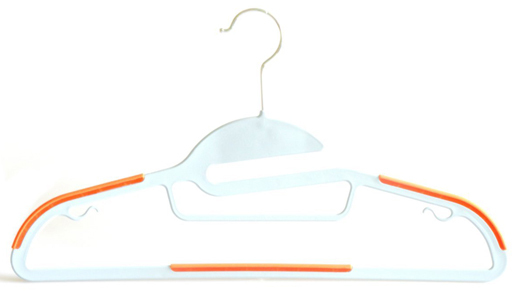 Tip: Treat your closet to quality hangers that will help extend the life of your clothes! Multi-Purpose ABS Light-weight Hanger Set: Super Slim, Built to Last! Don't you just hate it when your lined jackets always slip off plastic hangers? Would you like a slim, strong hanger that protects your clothes and brings order to your closet with a nice touch of style? You've probably tried every fancy hanger out there but they're simply too weak to hold heavy winter clothing. If so, discover the all new Slim and Sturdy Multi-Purpose Dry Wet Amphibious Hanger Set, the perfect solution for any closet! UNIQUE S-SHAPED TOP; convenient & easy to hang clothes and avoids stretching collar. Ergonomically designed perfect adaption to human curve, keep clothes wrinkle free. NON-SLIP SHOULDERS; prevents cloths from slipping, provide extra support for garments. MULTI-PURPOSE; great for hanging pants, shirts, suits and jackets and accessories. Backed by full money back guarantee. For quality products and an extensive selection, more people trust BRIA USA™ brand for all of their bedding, home goods and accessories.